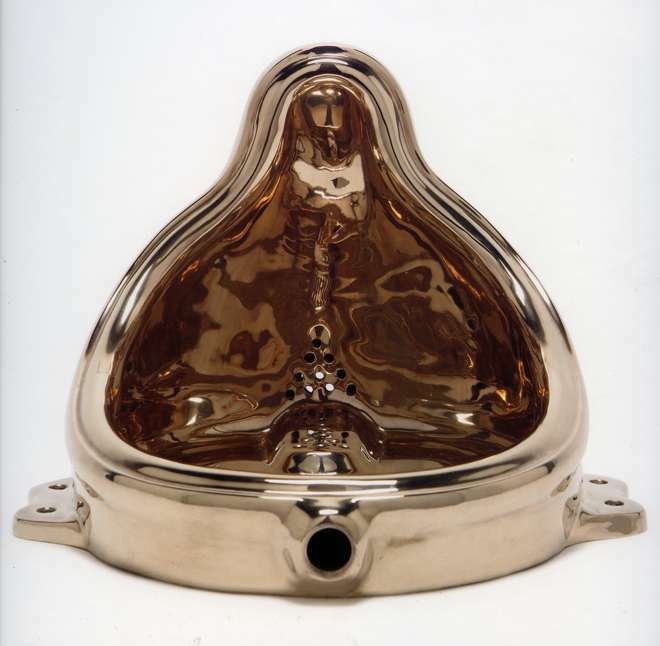 Fountain wasn’t Duchamp’s first readymade but it is probably the best know despite the fact that the original was lost. There is an irony here, of course. Given Duchamp’s notion of placing an existing object – by its very nature a multiple – into the gallery and declaring it to be art as a result, the concept of authorship and the status of the chosen object as the ‘original’ is not without its problems. Could the work have been replaced by another urinal bought from the same source? Given that the versions of Fountain now held by museums such as Tate are authorised replicas, is the ‘original’ now Stieglitz’s photograph, the official record of the work. 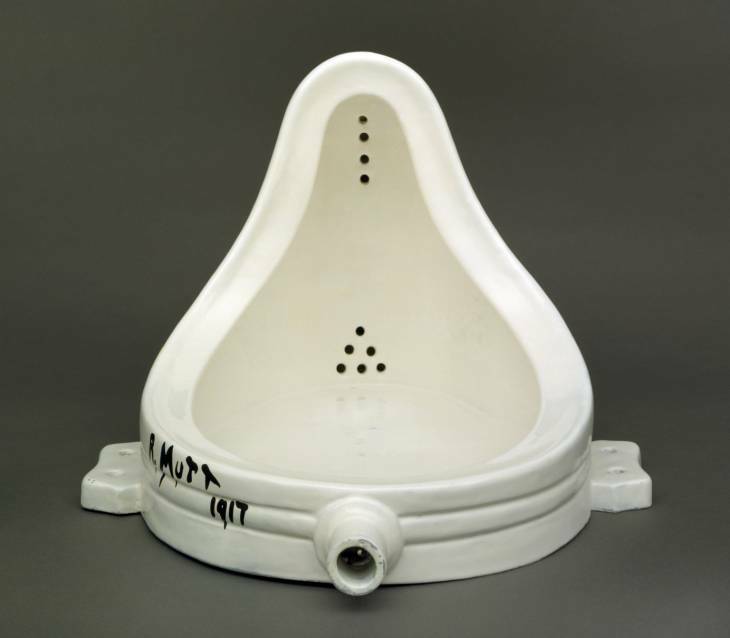 The notion of the readymade and Duchamp’s assertion that as an artist what he placed in the gallery should be seen as art is particularly interesting in terms of Fountain. Firstly of course, Duchamp chose to submit the work with an anonymous signature, so the question of authorship is further blurred. But also there is a pleasing irony in that the authorised replicas had to be carefully made; J L Mott Ironworks having closed, it wasn’t possible to buy readymade replicas, so the 1960s’ versions are bespoke objects made to a precise specification. Known for addressing questions of authorship and authenticity in her work – primarily as a critique of photography, a medium which is inherently copyable – Sherrie Levine’s take on Fountain takes the form of a replica cast in bronze and highly polished so that in some ways it formally resembles a gold buddha statue. Here the copy is exact in size and shape but what was originally a bought object is copied using a traditional approach to making sculpture opening up more questions about the nature of art. 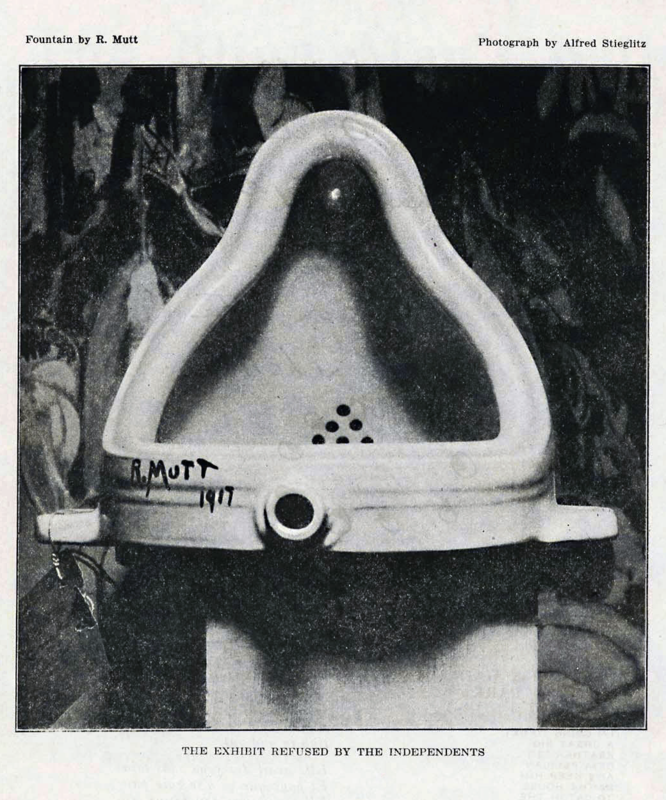 I’m unceasingly fascinated by Duchamp’s notion of the readymade and by the fact that the idea of an artist putting something into a gallery and declaring it to be art as a result of that act is now nearly a century old (Duchamp’s first readymades were about 1913 or thereabouts). Levine’s take is not only an interesting addition to that debate it’s also a really beautiful object. This entry was posted in Ideas, Sculpture and tagged Alfred Stieglitz, art, Fountain, Fountain (Buddha), Marcel Duchamp, R Mutt, readymade, sculpture, Sherrie Levine, urinal by Ann Jones. Bookmark the permalink. Great thoughtful summation & images. Thanks.